We understand life as a helpdesk support agent isn't easy, we get that! And we do not expect you to be sitting in your cubicle all day eyeballing your computer screen waiting for notifications to come in so you can act on them. This is absolutely not being productive and not forgetting, extremely boring!. 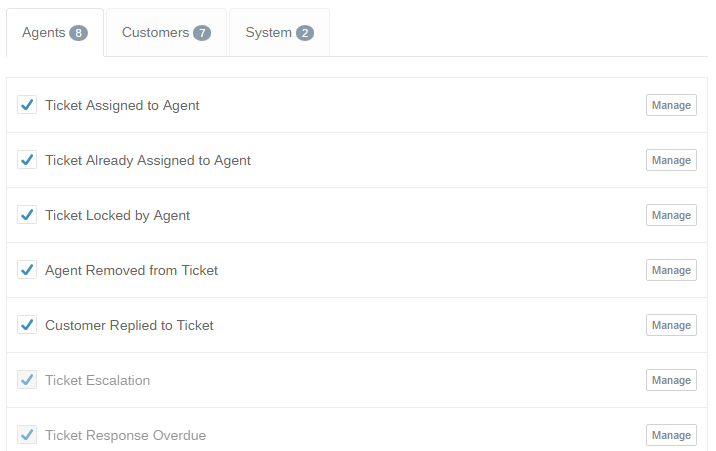 With Trakdesk, you can configure email notifications for many actions so that you are automatically alerted when things in your helpdesk requires your attention. Additionally, with a built-in wysiwyg editor, you can modify each email notification template with your own structure, layout and add placeholders for dynamic content, all in one place and easy to manage. Select the Email Notifications option. Click on the Manage button for the notification that you would to modify. Note: Locked notification templates are enabled by default and cannot be disabled. However, you can still modify their content and layout to meet your needs. After the editing page has opened, you can then modify its content and layout to your liking. You can also insert placeholders for dynamic content. Once finished editing, hit on the Save Changes button to apply any changes that were made to the template. 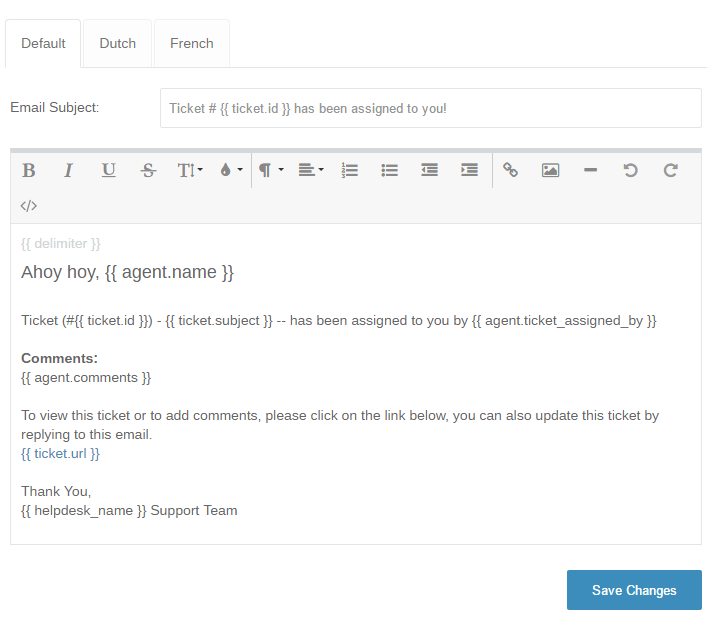 Note: If a customer or agent default language is set to Dutch but the dutch language template is not yet setup, your helpdesk will automatically use the default template email notification. Email notification templates can be customized and dynamic content can be added using placeholders. 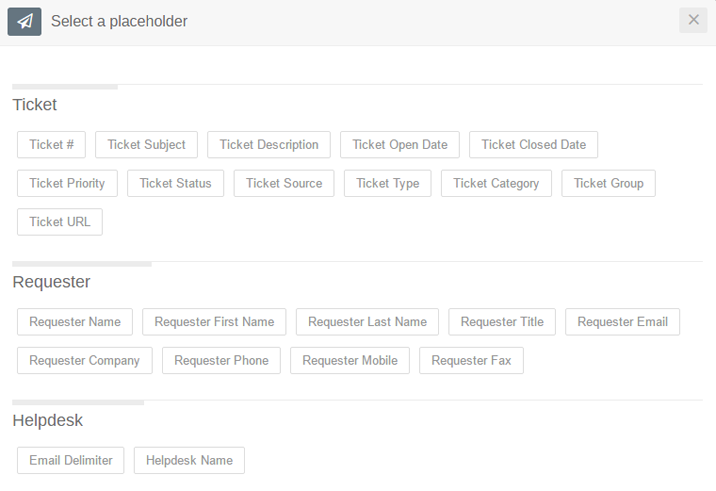 For example, you can notify customers when agents add, modify or close a ticket by inserting placeholders in the ticket subject or body. To add placeholders to your email notification templates, click on the area where you would like the placeholder to be inserted. Side note: Placeholders can be inserted into both the email subject and body. Custom default ticket and requester custom fields are also supported in placeholders. Then click on the Add Placeholders button. Once the popup modal has opened, select the placeholder that you would like to insert. On select, the popup model will auto close and the placeholder will be inserted. Repeat this process to add multiple placeholders.